Welcome to the website of All-Orch-Ideen. Lady's slipper orchids for the garden from the south of Germany a region called the 'Allgaeu'. These pages are specifically designed for garden and plant lovers looking for something special for their garden. Indoor Orchids are already now the most popular flowering houseplants. At last, there are orchids for your garden. Through successfull breeding we were able to produce Lady's slipper hybrids, which have proven their suitability for garden over the years and thus are not expensive and delicate to cultivate. We want to satisfy high demands and guarantee your success and delight with the orchids in your garden. They occur effectively by acquiring artificially propagated orchid garden against illegal nature harvesting. The plants grow all here in our rough climate and survive our winters without additional protection. All Cypripedium hybrids (slipper orchids) are shipped in October whilst in their start of dormancy. The number of bars of all hybrids increases from year to year, so that within a few years you will have great clumps in your garden - a beautiful and valuable focal point in your garden. You can study all presented Cypripedium hybrids (slipper orchids) without obligation and order direct online. 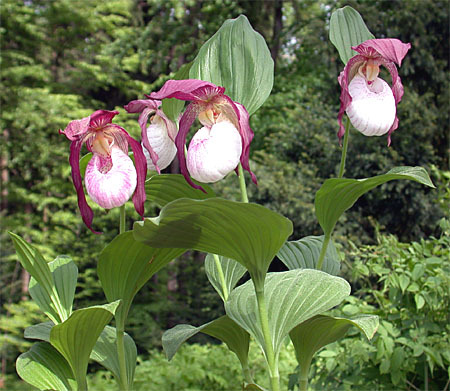 All Cypripedium hybrids are just sent at the best time for planting in the fall (in early October). Orders are open all year round and can be reserved binding for fall shipping.